1 – Organic Plant-Based Foods That Contain Probiotics— Here are My Top 8 Probiotic Containing Foods. Organic Sauerkraut – Sauerkraut contains over 200 different strains of good probiotic bacteria which are good for building up our probiotic good bacteria in our gut. And sauerkraut is easy to make all you need is organic cabbage and salt… that’s it and a bit of time. There are lots of recipes online about making sauerkraut. I recommend you eating 1/2 cup daily of fresh live organic sauerkraut. 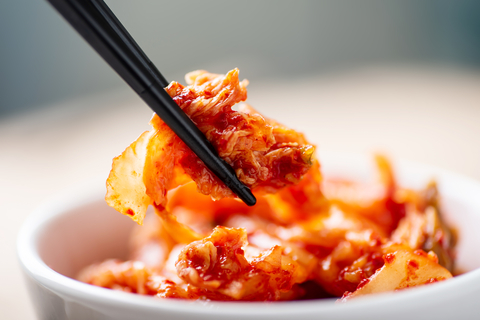 Organic Kimchi – Kimchi is loaded with lots of probiotics over 400 different strains of good probiotic bacteria. I always have kimchi in the fridge and enjoy a 1/2 cup of kimchi now and then. Kimchi is great if you enjoy spicy food. Organic Miso – Miso is another great fermented food that contains lots of probiotic bacteria and also good fungi that live in our gut called Koji in Japan. Good gut flora is made up of bacteria, fungi, and viruses. And miso is another way to add more probiotics to our system. But remember miso is salty so a little goes a long way… have some miso soup a couple times a month. Organic Kombucha – Kombucha is a type of fermented green or black tea and it’s best made fresh because you get all the live bacteria which replenish your probiotics. And it also contains good yeast which helps to prevent the overgrowth of bad yeast such as candida. Having a little fresh kombucha 2 or 3 times a week is great for the GI tract. You can order kombucha starter kits online and make your own. Organic Vegan Soy Yogurt – Organic Soy Yogurt is easy to make and full of good probiotic bacteria. Make sure to use a vegan starter culture and a good organic soy milk. It’s one of my favorite things and I make it in my instant pot pressure cooker on the yogurt setting. Much cheaper than buying it at health food stores and you get to control the quality of the product. Eat some organic soy yogurt weekly. Fresh Organic Cucumber Pickles – Fresh pickles contain lactic acid bacteria which are beneficial for the body. Anything which is in the cold section of the grocery store will be a live product… all other pickles are pasteurized and all the bacteria are killed. Keep pickles to a minimum they do contain lots of salt… and make sure they are organic and don’t contain chemicals. And these pickles are easy to make you can find lots of recipes on the internet. Eat a few organic fresh pickles monthly. Fresh Organic Green Tomato Pickles – You can also ferment organic green tomatoes and they are full of lots of good bacteria that boost up our probiotics. You can find lots of recipes on the internet and they are easy to make. My wife’s father used to make them and now my wife makes them and we love them. Eat 2 or 3 pieces of fermented green tomatoes a week. 2 – Organic Plant-Based Foods That Feed Our Probiotic Bacteria— Here are My Top 5 Best Probiotic Feeding Foods. Cooked Organic Green Bananas and Plantains – Cooked green organic bananas and plantains contain lots of resistant starch which feeds our probiotic bacteria. You can always find green organic bananas at organic markets and they are easy to cook. Some people peel them and then cook them in boiling water for 30 minutes. That is what I do I feel they taste great that way. But many people cook them with the peels on and then peel them later… they are easier to peel that way. I recommend eating at least 4 or 5 cooked green bananas weekly. Organic Oatmeal – Organic oatmeal also contains resistant starch and I feel it’s one of my mainstays of baking. Instead of any kind of flour, I love oatmeal flour… full of great vitamins, minerals, soluble and insoluble fiber for heart health and for growing those good bacteria. I recommend eating at least 1 cup daily… or more. Organic Cooked and Cooled Brown Rice – Organic brown rice contains lots of good resistant starch to feed good bacteria. And we make a big batch of brown rice weekly and use it daily. It’s a mainstay of our cooking at home and will feed your hungry probiotic bacteria. Brown rice must be cooked and cooled to form the resistant starch and then it can be reheated. I recommend 1 1/2 cups of organic brown rice daily. Organic Beans of All Kinds – Organic beans are a great source of resistant starch and are one of the most important foods for long life and great health and for feeding your hungry probiotic bacteria. Eating just one cup of any kind of beans daily adds 4 to 10 years to your life — Wow! And I did a study of all the groups of people around the world who live to be over 100 years old and the only thing they have in common is that they all eat beans. I recommend eating at least 8 to 16 oz of organic beans daily. Organic Corn Flour – Corn flour or Masa also contains lots of resistant starch and will help to feed your hungry probiotics. Making tortillas which are corn flour and water are a great way to get more resistant starch in your diet. We make tortillas once or twice a week. But I also recommend using corn flour when you bake. I just made a holiday Whole-Foods Plant-Based cake using organic corn flour and oatmeal flour. I recommend enjoying some organic corn flour at least twice a week or more. This entry was posted in Healing Herbs and tagged Best Organic Plant-Based Probiotic Building Foods, Cooked and Cooled Brown Rice, Cooked Organic Green Bananas and Plantains, Corn Flour, Dr. Paul Haider, Fermented Live Pickles, Fermented Live Tomato Pickles, Having a Great Life, Healing, Health, Here are My Top 5 Best Probiotic Feeding Foods, Here are My Top 8 Probiotic Containing Foods, HH, Kimchi, Kombucha, Master Herbalist, Miso, Oatmeal, Organic Beans, Organic Natto Fermented Beans, Organic Plant-Based Foods That Contain Probiotics, Organic Plant-Based Foods That Feed Our Probiotic Bacteria, Photo, Sauerkraut, Soy Yogurt, spiritual teacher, USA. Bookmark the permalink.